A couple of weeks ago, we explored how to best utilize your kitchen storage. We heard from you that it was so useful — especially for those living in the NYC area — we decided to extend the organization to the next most chaotic room: the bathroom! Let’s walk through all the main areas where clutter accumulates and how to fix it ASAP. Such a wide variety of things get stored in the bathroom (cleaning products, shower supplies, makeup . . . ) it can pile up fast, and the last thing your morning scramble needs is more chaos. Try an expandable shelf to keep these items organized and separated for easy access. Image via Bed Bath & Beyond. Whether you’re sharing the bathroom with a roommate or significant other or even if you’re not, it’s nice to keep your products separated and categorized. 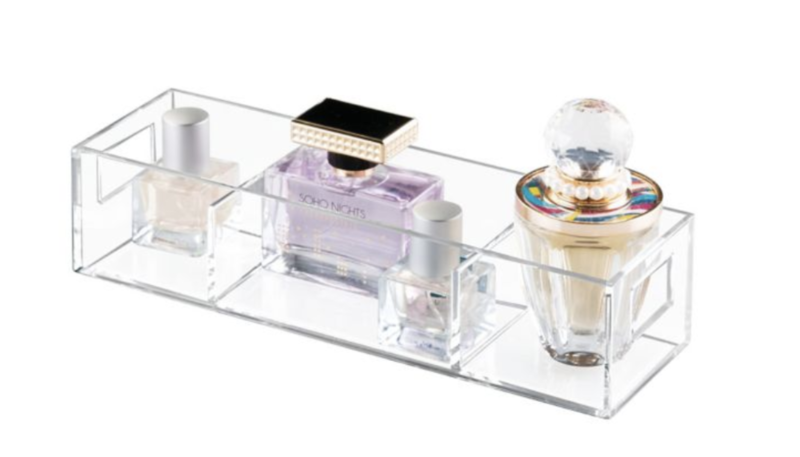 From medicine bottles and oral hygiene products to makeup and nail polishes, these acrylic organizers with keep everything anchored in its place! Some bathrooms seemingly lack appropriate space for towel racks, causing you to use up valuable under-sink storage. There’s another way! Try a wall-mounted rack for inside the shower. The best part is that your towel will be easily accessible before stepping out. When under the sink is already overflowing, you need reinforcements. Take advantage of oft-neglected height and try an over-the-toilet storage system. It’s perfect for storing extra toilet paper or towels. Are there any bathroom storage solutions you love? Share it with us here or on our Facebook page!